Description: Parish Office is closed for Easter. We will return to the office on Tuesday, April 3, at 9:00am. Description: Come spend time in prayer and build a deeper relationship with Christ. Description: Join the Men of St. Joe's every Saturday morning at Pee Wee's for prayer and fellowship. 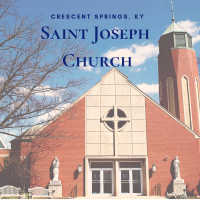 Description: Come pray with the women of St. Joseph Catholic Church at Pee Wees on Anderson Rd. Crescent Springs, Ky. Description: Also by appointment. Call 859-341-6609. Description: Festival Meeting in Noll Hall. Description: Choir Practice in the Church. Description: Women's CRHP will meet in Noll Hall. Description: Our annual pilgrimage will take us to Indiana. We will tour St. Meinrad Archabbey, experience lunch at Schnitzelbank Restaurant, and much more. Parish Office is closed for Easter. We will return to the office on Tuesday, April 3, at 9:00am. Come spend time in prayer and build a deeper relationship with Christ. Join the Men of St. Joe's every Saturday morning at Pee Wee's for prayer and fellowship. Come pray with the women of St. Joseph Catholic Church at Pee Wees on Anderson Rd. Crescent Springs, Ky.
Also by appointment. Call 859-341-6609. Festival Meeting in Noll Hall. Choir Practice in the Church. Women's CRHP will meet in Noll Hall. Our annual pilgrimage will take us to Indiana. We will tour St. Meinrad Archabbey, experience lunch at Schnitzelbank Restaurant, and much more.